Pi Day (3.14) seems like an appropriate day to write a post I’ve been thinking about for some time, a post about pies. Food trend predictions pointed to 2011 being the year of the pie with pies, both sweet and savory, being purported to be the new cupcake. When I started thinking about pies in January I couldn’t (off the top of my head) think of many places to find pie in Columbus. Being English I grew up eating savory pies: Shepherd’s pie, fish pie and cottage pie, as well as pork pies and pasties. 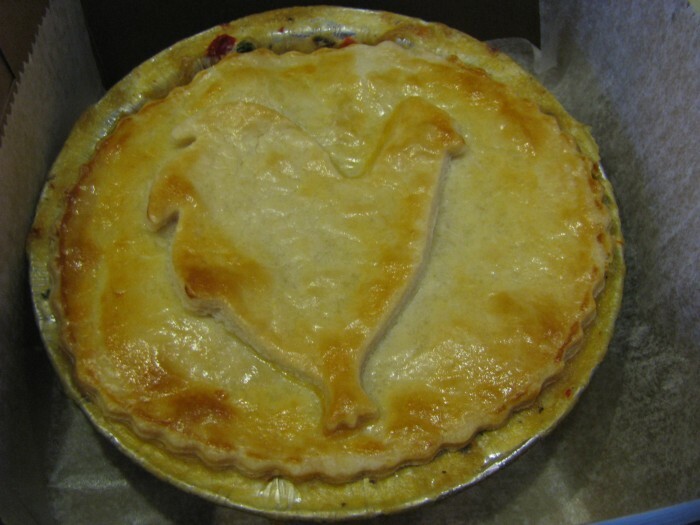 I spent many happy Sundays pairing a walk in the country with a pub lunch of steak and kidney pie or game pie topped with puff pastry, and I’m not sure if I’ve ever eaten it, but I love the name of stargazy pie. These are the pies that my mind first turns to when I hear the word pie and these were the sort of pies I was looking for – hearty winter comfort food. When I asked for pie suggestions on twitter most of the wealth of suggestions I received were for sweet pies. I continued my research – sampling some of the dessert pies suggested and seeking out more savory options. Last week’s Dine Originals week showed that Columbus is slowly embracing the pie trend with pies featuring on at least four of the menus, most notably Deepwood’s cherry pie on a stick. Latitude 41 has been featuring rabbit pot pie as one of their small plates and G Michael’s currently has a tasty pheasant pot pie with apples, yukons, gouda, and thyme on their appetizer menu. Both Deepwood and Black Creek Bistro occasionally offer pies as a special (both offered pies during Dine Originals week). Kitchen Little at the North Market make take-out batches of chicken pot pie, using local chicken (call for availability) and Sassafras Bakery make chicken pot pies (pictured above) and savory hand pies to order, as well as all sorts of delicious sweet pies. Sassafras’s pies are also available at Worthington Farmers Market. Salam bakery make a variety of Middle Eastern pita pies each morning and are usually sold out by lunchtime. Our favorites are the cheese and the fava bean. You can also find Middle Eastern pies at Jaffa Market at Godown and Bethel. One of the names that came up a lot on twitter was ‘Just Pies‘. 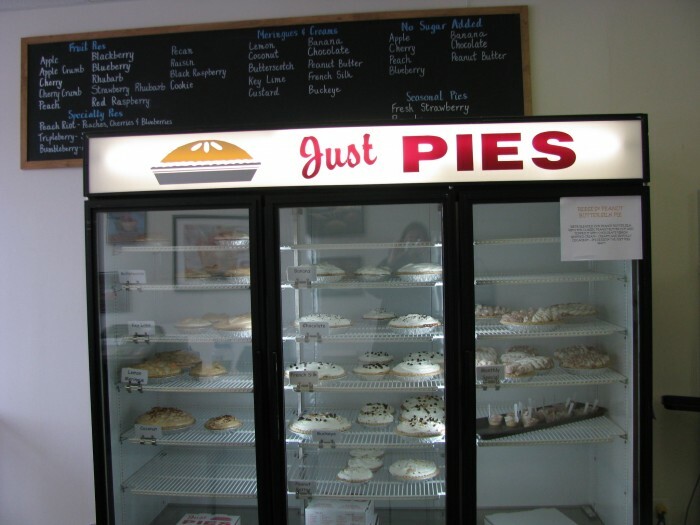 They have two locations (Westerville and Worthington) and make 25 varieties of pies from scratch daily. Just Pies are made with a lard crust, apparently one of the secrets of their popularity. They are also sold at Independent grocery stores such as The Hills Market, Weiland’s and Huffman’s. Their cherry pie is pictured in the header. 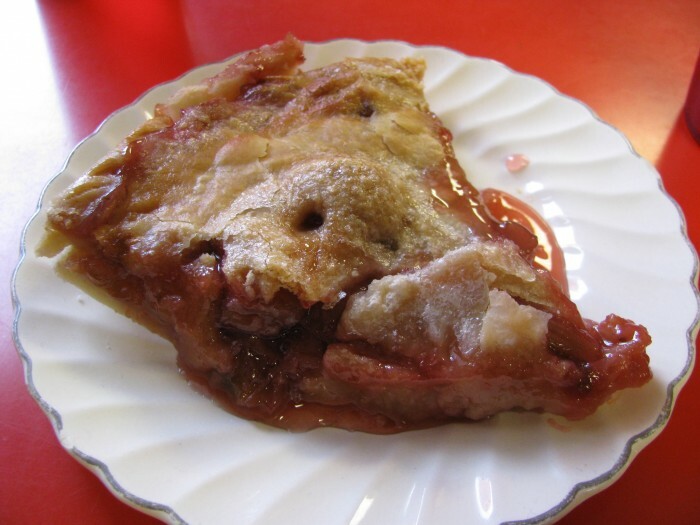 Also in Worthington is Mrs Goodman’s, a bakery who make from-scratch fruit, pecan and cream pies. I’ve yet to see how their pies compare. 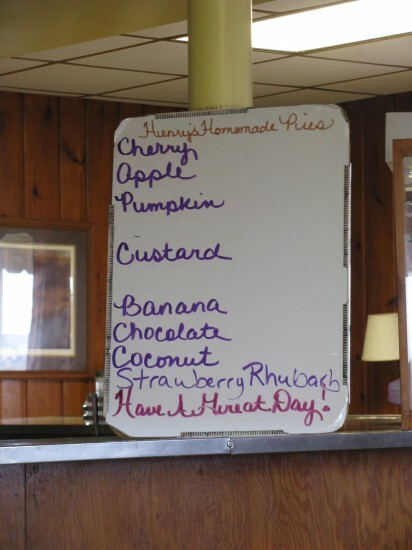 One of my favorite dessert pies was at Henry’s in West Jefferson. Henry’s is a quaint little diner on Highway 40 that’s definitely seen better days. Each day they make about 6-8 home made pies and their crust is almost impossibly thin and light. We tried the cherry and the rhubarb and strawberry (slice pictured above). If you have other pie recommendations please leave them in the comments. I’d be particularly happy if I could find a good steak and ale pie. Love pies! All look delish! Just Pies are good! The best pie I’ve had in a long time I found at the Grove City farmer’s market last summer. There is a seller there that does homemade pies made with fresh fruit and the best crust I’ve ever had! The lady also had other good baked items. I lost their card with contact info. so I can’t wait for the farmer’s market season to start again to get some!! The problem with Just Pies is the filling, with Mrs Goodmans, it’s the crust. I’m still looking for the perfect bought pie. Have you tried Sassafras bakery’s pies? You can find them at the Worthington Farmer’s Market and hopefully they will have a retail bakery of their own soon. We had AJ make pies for my daughters wedding in May 2013. These are the greatest pies on the planet and my family has had many. She has now opened a shop in downtown Worthington. Suggest you give them a taste………your Grandma would be proud. THE BEST!